Most of my time will be spent there with keeping the content fresh and up-to-date. It was great writing for you in these last couple of years, but it is not the end. Thank you for all the support and thank you for reading. Who is the Big Six in the wine world? Who is the Hale Berry of wine berries, the George Clooney of Grapes or the Naomi Watts of Wine? 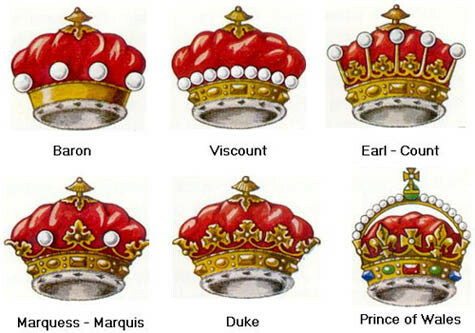 Well in the wine drinking world, there is an A-list of grape varieties better know as The Noble Grapes. These A-Listers are famous culturally and historically and are internationally known and grown, constantly producing quality wines year after year (that is if they are planted in the right type of soil, climate and “directed” by a capable wine maker). Known for its crisp, grassy, gooseberry and citrus flavours. Depending on the growing climate, Sauvigon Blanc can range from the really green, bone dry style to the vibrant tomato vine, gooseberries and green pepper style. Some Sauvigons are blended with a small amount of Semillon to make the classic Bordeaux style whites while other Sauvignon Blancs are wood matured in French oak barrels to give a distinctive smokey character. Some love Chardonnay, while others hate it, but no one can deny it. It is an easy growing vine that yields good quality fruit, which makes it a favourite with grape growers. 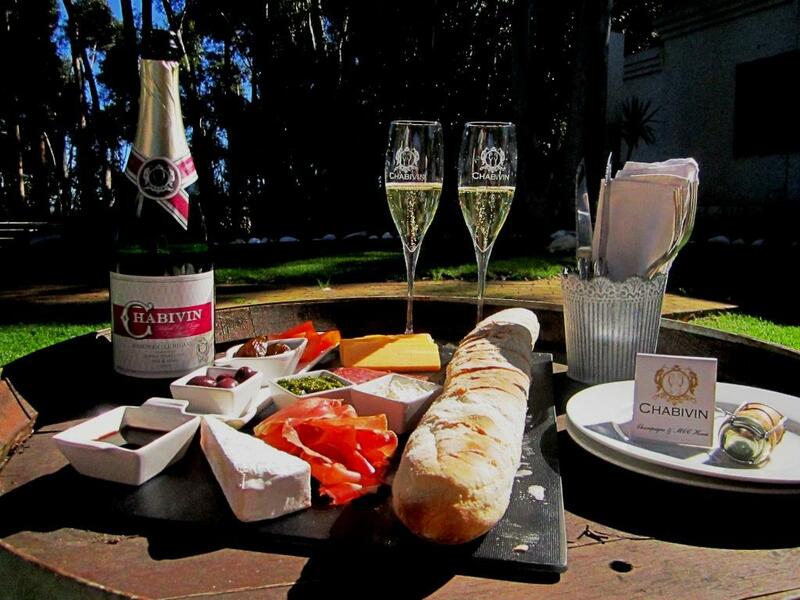 It is also one of the three main varietals used in Champagne (or MCC, if you are in South Africa). It is a versatile grape and can produce a style of wine that’s fresh with lemony notes when it is unoaked or rich creamy style which can remind wine drinkers of buttered toast, almonds and honey. Unfortunately there are other Chardonnays on the market that are so excessively wooded that the subtle fruit characters are overpowered and flavours and can be unappealing. This varietal causes quite a bit of confusion in South Africa, because in the past wine drinkers could choose between wines labelled as Rhine Riesling, Weisser Riesling, Paarl Riesling or Cape Riesling. Current legislation requires that the original Riesling varietal planted in South Africa can be labelled as Riesling where as the wines labelled as Cape Riesling is in fact Crouchen Blanc. The good Rieslings that you will find can range from wines that are refreshing and racy with a steely acidity, while others can have a more lime and orange pith characters. Personified as a very “masculine” wine and is internationally admired. The trademarks of a good Cabernet Sauvignons are the deep dark red colour, the full-bodied character and taste of blackcurrant combined with a good tannin structure. Maturing the wine in oak barrels adds tobacco, cedar wood and chocolate characters which make the wine more complex. Cabernet Sauvignon or predominantly Cabernet-led blends are the flagship of many wine producers. Sadly, the poor Cab’s out there have stalky-green characteristics that are not appealing at all. This is a super popular grape varietal with a large spectrum of wine drinkers. Described as a “feminine” wine, it is a little bit softer and rounder than Cabernet with juicier ripe berry flavours which makes it more approachable. For many wine drinkers, when faced with a choice of wine, Merlot is the go to varietal since it difficult to really get a “bad” one. Merlot also blends well with Cabernet making a good “marriage” between feminine and masculine grape types. unfortunately Pinot Noir is like the French nouveau art film actors and hardly produces good wines outside its native Burgundy. Many new world wine growing areas tend to blunder Pinot Noir, resulting in a wine that seems disjointed with either too much fruit, hard tannins or just not enough body. 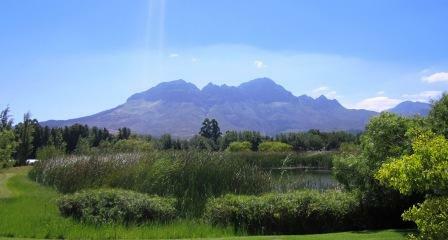 Only in the cooler areas of South Africa, does Pinot Noir do well. 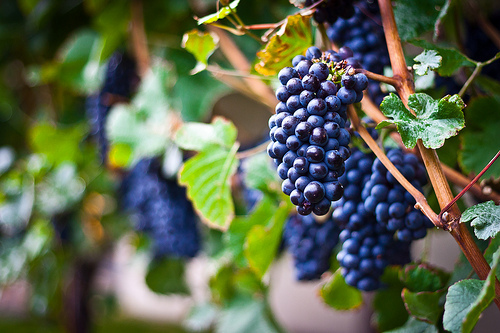 Pinot Noir is also one of the three grapes used in Champagne / MCC. This is not to say that grape varietals like Chenin Blanc, Pinotage or Shiraz doesn’t make as good wine as the Noble Varietals, just that the wines listed are the internationally known. Any excuse pulling the cork on a bottle of wine, eh? I found myself in a predicament last week, at a family dinner I brought a magnum bottle of Shiraz. Apart from being striking addition to any dinner table, I was looking forward to this beautifully aged wine. However when I pulled the cork, my nose was not filled with the delightful aromas from the wine, but rather a dreadful damp smell, as if a wet carton box was left in a corner of a cold musty concrete warehouse for a couple of months… not nice at all. The wine was spoiled by a compound known as 2,4,6-Trichloroanisole (or just TCA for short). Found in natural corks and sometimes in barrels, this compound is the cause of this musty aroma and flavour. 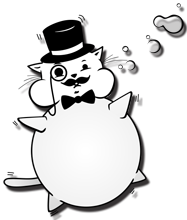 One of the tricky problems with TCA is that the off-character varies from bottle to bottle and sometimes can be very hard to pick up in a wine. The production of TCA in cork or its transfer by other means into wine is complex, but most results when naturally-occurring airborne fungi are presented with cholophenol compounds, which they then convert into chlorinated anisole derivatives. Chlorophenols taken up by cork trees are an industrial pollutant found in many pesticides and wood preservatives, which may mean that the incidence of cork taint has risen in modern times. Ironically, chlorophenols can also be a product of the chlorine bleaching process used to sterilise corks; this has led to the increasing adoption of methods such as peroxide bleaching. So cork taint is not necessarily an indication that the wine is bad. It’s an outside factor that made the wine taste off coming from either the cork or the barrel. So what do you do if you have your bottle of wine that has been affected? Sadly nothing will make the wine better. Take it back to the producer or wine shop and they (ought to) replace it for you. I don’t know if it will work, but I am very interested give it a try. 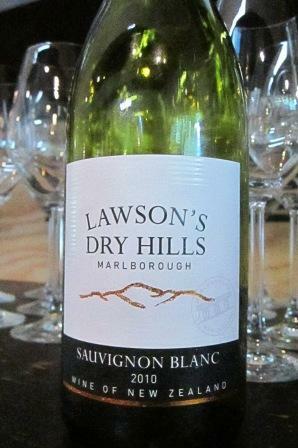 It is not everyday that I will select a foreign wine for a tasting over our own South African produce, but out of interest I picked the Lawson’s Dry Hills Sauvignon Blanc 2010 from Marlborough, New Zealand. Lawson’s Dry Hills was founded by Ross and Barbara Lawson in 1992 after growing their own grapes on their Alabama Road Vineyards from 1980. Starting with Gewürztraminer, Lawson’s Dry Hills soon expanded and now also make some fantastic Sauvignon Blanc, Chardonnay, Riesling, Pinot Gris and Pinot Noir. Our philosophy is a simple one – To produce premium Marlborough wines of great character, quality and varietal expression. I always held the impression that New Zealand Sauvignon Blancs were green, reductive and steely. The Lawson’s Dry Hills was all that, however amongst the green characters the wine also contains loads of passion fruit, gooseberries and granny smith apples, which made it complex and intriguing. The Sauvignon Blanc grapes has been sourced from 7 different vineyards all situated in the Marlborough wine growing valleys, each one with its own micro climate and character and 7.5% of the wine in French oak barrels for complexity. I found this to be an interesting Sauvignon Blanc which surprised and challenged me to change what I normally would have perceived Marlborough Sauvignon Blanc would taste like. It is a delightful wine and was loved by all the other tasters. 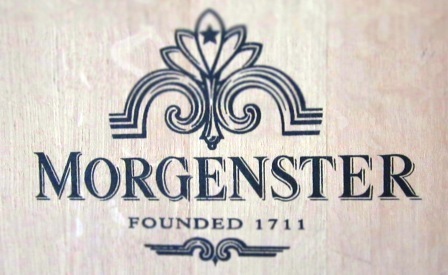 Situated in Somerset West, Morgenster (Morning Star) is known not just for award winning wines but also world renowned olives and olive oils. 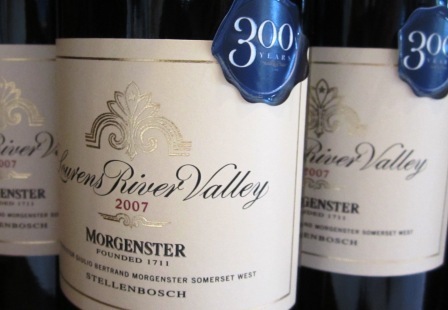 Morgenster produces three different ranges of wines: The Lourens River Valley, The Morgenster and the Italian collection. This Bordeaux style blend offers fresh dark berries with an elegant tannin structure. The aftertaste lingers with dark cherries and has a smoky finish. This is a well put together and complex; the wine has layers and layers of flavour that reminded me of red cherries, cigar box with earthy characters. Caruso 2011 Rosé – Made from 100% Sangiovese and is named after Enrico Caruso, the Italian opera singer. This delightful wine is perfect for summer picnics. Light, fresh and packed with strawberries and pepper flavours. Tosca 2008 – Sangiovese, Merlot, Cabernet Sauvignon and Petit Verdot Blend. Rich and fruity with a wonderful velvety mouth-feel. Nabucco 2008 – A great Nebbiolo, Merlot and Petit Verdot blend. Smooth, rich with plums and blackberries. I don’t know a lot about olives, before this tasting I thought there were only three types of olives in the world (Black, Green and Kalamata). So I was delighted to learn more about one of my favourite snacks. 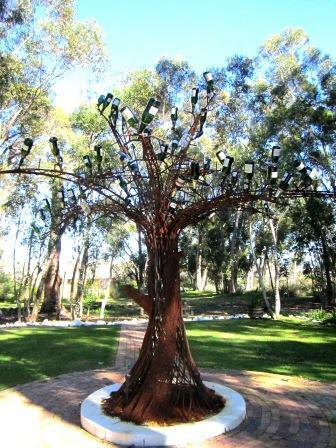 Morgenster have 22 different types of olives trees planted on the farm. 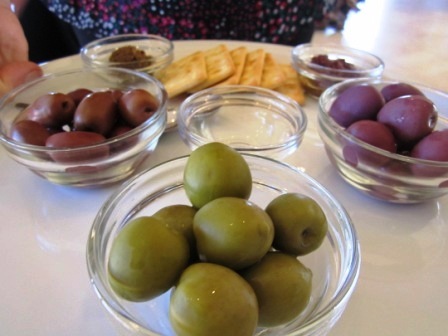 The three table olives that they serve for the tasting – Kalamata, Moresca (black) and Nocellara Del Belice (green). Olive oil paste – Made from a variety of green and red olives, the black and green olive pastes are perfect as spread on the bread that they offered with the tasting. Lemon Enhanced Extra Virgin Olive Oil – Infused with lemon zest for 72 hours, this olive oil has an intense lemon character with the same pepper and grass flavours. White Truffle Extra Virgin Olive Oil – Love it or hate it, you cannot deny this intensely flavoured olive oil. I would love to add a dash of this olive oil the next time I cook a risotto. Monte Marcello Ev Olive Oil – An olive oil that reminded Morgenster’s owner of the olive trees situated around his home in Italy. The olives used to make this oil ripen later. The result is an oil that is creamy and smooth. Balsamic Vinegar – Imported from Modena and made in a traditional method that goes back from medieval times this balsamic vinegar has been fermented in old oak barrels and aged for three years. The vinegar is rich with loads of flavour. All in all this was a wonderful taste experience. 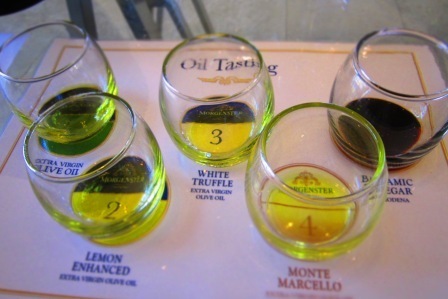 I’ve tasted interesting wines and learned about olives and olive oils. 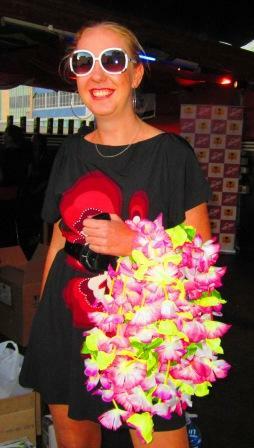 Thank you Morgenster, you’ll see me again soon! 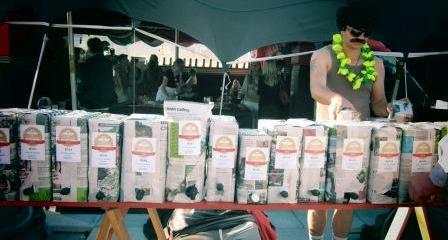 The task seemed simple enough: Taste 39 boxes of wine and scoring each wine out of 10. However this task soon became a challenge as palate fatigue started to set in half way through the tasting. Some of the wines were truly shocking, some interesting (referring to the “baba doek” comment made by Batonage), while others were not bad at all. Thanks to Jan from WineTimes and 406, the scoring was made easy. A nifty program was written where wine tasters could score the wines from their cellphones via Twitter. These scores were then automatically calculated and the results revealed at the end of the evening. The Wood Stock, suppliers of beautiful cutting boards were there as well, keeping us going with a steady supply of delicious snacks. 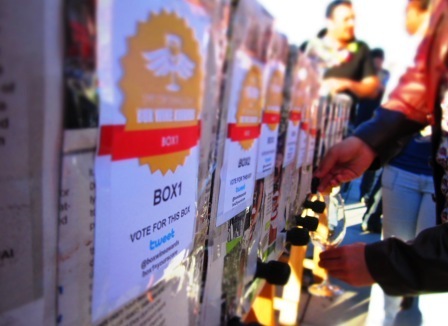 So according to The Box Wine Awards; who makes the best white and the best red box wine in South Africa? Click here for full results on WineTimes website. Well done to the winners and thank you Spit or Swallow for the great evening!